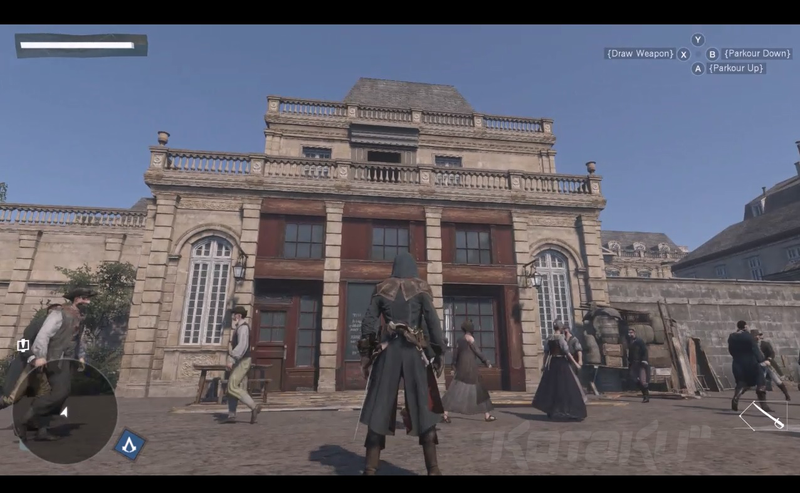 One of this fall's big Assassin's Creed games, called or code-named Unity, is set at least partly in 18th-century Paris, according to early leaked screenshots obtained by Kotaku. These screenshots, sent to me by a source who requested anonymity, show Unity's new assassin roaming around what appears to be Paris. You can see Notre Dame, the Seine River, and other Parisian landmarks, and the shots are very clearly from an early version of the game. What's more, this is just one of two major Assassin's Creed games that will be out later this year, according to a number of sources. Unity will be for the current-gen consoles—Xbox One and PS4—while a second game, possibly called or code-named Comet, will be released on Xbox 360 and PS3. Presumably one or both versions will also be on PC. Sorry, Nintendo fans: I haven't yet heard anything about Wii U. This information comes both from web chatter and our own conversations with developer sources. For months now we've heard rumors and rumblings about what could be the next installment in Ubisoft's popular assassin-parkour series, which has been released on an annual schedule for five years now. There's been a new major Assassin's Creed every fall since 2009. Interesting as all this is, the prospect of two major AC games this fall is particularly noteworthy. Some might be excited that Ubisoft is liberating their teams from the shackles of cross-gen development for Unity, which won't have to make any compromises to fit into last-gen hardware. But some critics have already accused Ubisoft of milking the Assassin's Creed franchise—in the past five months alone we've seen Black Flag, the mobile game Pirates, the HD remakes of Liberation, and an Assassin's Creed board game called Arena. Two new games this fall could add to Assassin's Creed's reputation as an overused series. A few weeks ago, rumors about Unity popped up on the gaming forum NeoGAF, and were later corroborated by Examiner's Nicholas Gigante, who has been correct about Ubisoft-related rumors in the past. The gist: Unity is one of two Assassin's Creed games this fall; Unity is set during the French Revolution; Unity stars an assassin named Arno. This all matches up with rumblings we've heard in conversations with our own developer sources. It also meshes with the screenshots we've obtained (all posted below). Last month, Assassin's Creed producer Jade Raymond told AdWeek that the next game in the franchise would be set during her "favorite historical era." A fake internal e-mail in last year's Assassin's Creed IV hinted at a number of potential historical settings for future games in the series, one of which was the French Revolution. Last year at E3, Ubisoft boss Yves Guillemot told Kotaku boss Stephen Totilo that they had three Assassin's Creeds in development. When reached by Kotaku this morning, Ubisoft declined to comment on this story. One notable new feature: there are now buttons to "parkour" up and down. I hear this is part of a new Assassin's Creed navigation mechanic that will debut when Unity releases this fall.